At Christmastime does an elf come and visit your family and stay for awhile to keep an eye on your child and report their behavior back to Santa on Christmas Eve? 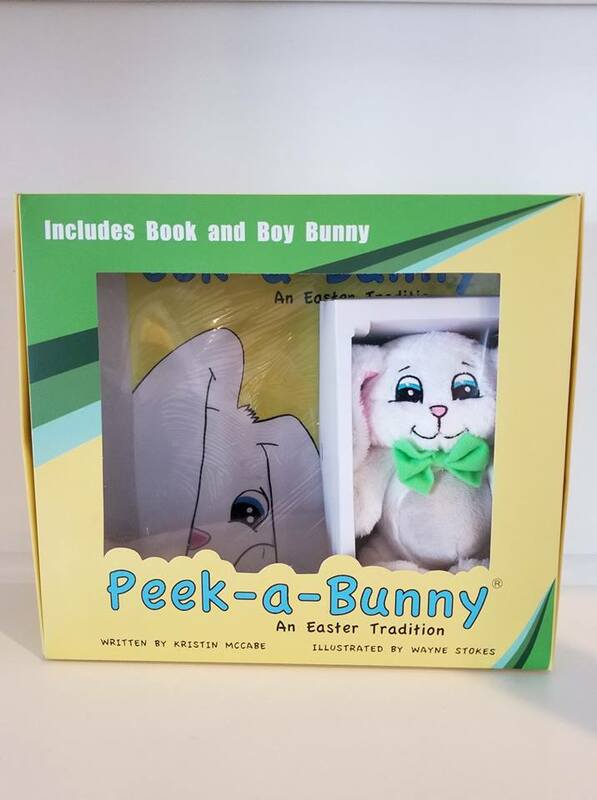 If your kids love having a visiting elf come at the holidays, then they will love the new Peek-a-Bunny: An Easter Tradition gift set, which includes a children's book written by Kristin Mccabe, and plush girl or boy bunny (your choice). My girls have brother and sister elves come and stay with us in December. They love waking each morning to run around the house trying to find their elves. Unlike other elves who get into mischief, we just have our elves hide around. The girls can't touch them as they will lose magic and need to go back to the North Pole to get more magic from Santa, but they can get up close and leave little notes and talk to them -- usually adding new toys that they see commercials for on television, for the elves to report back to Santa with. Even though my girls like the whole elf tradition, they always tell me how they wish they could cuddle and hug their elves whenever they find them. I know some families who let their kids touch their elves the day they arrive or the night they leave, but we are a strict "no touch" house, as I know my youngest would want to touch them more often or wonder how they can touch one day and not the other. 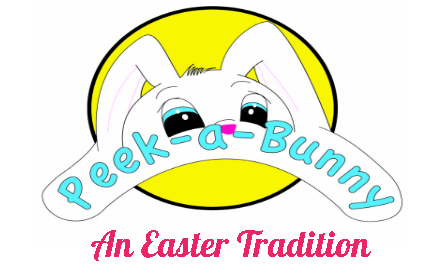 I wondered if there was a fun Easter tradition that was similar to the elves at Christmas, and that is how I stumbled across the Peek-a-Bunny website, and fell in love with this fun Easter tradition. "Peek-a-Bunny is a family friendly, interactive book that lets you play with the little Baby Bunnies! Have fun playing Peek-a-Bunny with your new Bunny friend in the weeks leading up to Easter!" What I really liked about this new tradition which we started this year in our house, is that the girls can snuggle all they want with their Peek-a-Bunny. They can carry it around with them and have it sit with them to read, watch television or do schoolwork. The only thing they have to remember to do is put the plush bunny back in its hiding spot each night for it be able to move around and hide in a new spot for kids to find the next morning. Another great feature of the Peek-a-Bunny, next to being able to touch it, which I love a lot of kids will love to do, as you can't resist this cute and oh so cuddly white bunny, is that the story that comes as part of this gift set is easy for kids of all ages to understand, and one they will love to have read to them over and over again. The story tells about how the Peek-a-Bunnies came about and what they do while visiting your family, before they head back to report back to the Easter Bunny. Kristin did a wonderful job with this cute story, which will definitely get the whole family excited for welcoming a new friend in the house at Easter time. If you are thinking to yourself, this sounds like a lot of fun, but I am not ready to be on the hook for moving the bunny day after day, and chance running out of places to hide it, don't fret, as unlike the elves which stay for about a month, you could have the peek-a-bunny come whenever is convenient for you. We received the Peek-a-Bunny girl gift set last Tuesday and I shared it with the girls the next day. So, we have had it for a week now, and have one more week until Easter. So, this year we will have the Peek-a-Bunny around for a couple weeks. I can handle this. :-) If you pick up the Peek-a-Bunny now, you can start it as soon as you get it and hide it all of next week before the Easter Bunny arrives on Sunday, April 1st. Then, next year you will have the Peek-a-Bunny set and can do longer if you wish. This is supposed to be a fun new Easter tradition you share with your family, and not something this will stress you out or make you go crazy trying to think of things to do with the bunny. All you have to do is hide it in a different spot each night, and let the kids find the next day. Just be sure if they do pick up and move it about, that they put it back in the hiding spot it was found that morning so that the Peek-a-Bunny can hide again that night. My girls are really getting into this new Easter tradition, and continue to tell their friends about it. They are curious if their friends have Peek-a-Bunnies visiting them. This leads to their parents asking me about it and wanting to get a Peek-a-Bunny for their family. Want to add this fun Easter tradition to your family's Easter traditions? 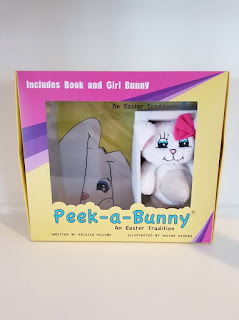 Then, head on over to the Peek-a-Bunny website and order a book and plush set for your family today. 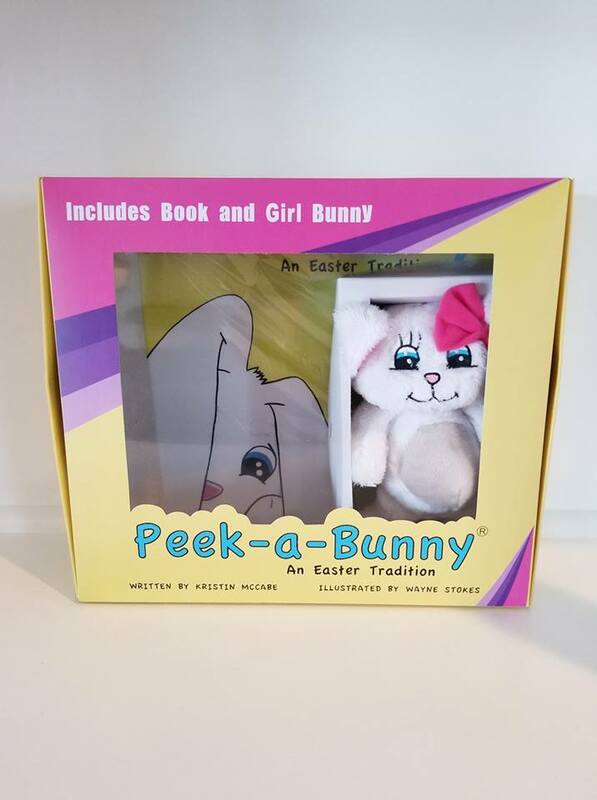 I know that once you see this cute book and plush set that you will fall in love with this fun Easter tradition, and your kids will have so much fun waking each morning as they count down until Easter, to look for their bunny friend who has come to visit.